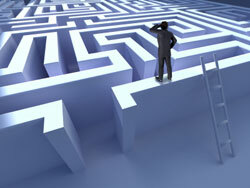 Navigate the library maze with a mentor! While the district consultants are always available to offer support and advice, sometimes a conversation with another librarian can also be helpful. The Maine State Library introduces the mentoring service to link librarians with questions to librarians who have working knowledge and experience to share in specific areas. A mentor is an experienced person who willingly provides professional and useful advice to other librarians in order for him/her to achieve success. As a working librarian, you have a wide range of experiences to bring to a mentoring relationship. You can be a source of advice and information to someone who is having a difficult time and/or just needs some guidance in an area of librarianship. Being a mentor can provide you with the opportunity to make a difference in someone’s life and to contribute to the library profession. Why are mentors so important? Mentors play a significant role in the lives of developing librarians by serving as teachers, coaches, counselors, and role models. They provide feedback and encouragement, offer advice, and help others make the connection between their present and future performance. What is your role as a mentee? Participate in statewide activities and learning opportunities. Provide feedback of MentorME so the program can improve as needed.